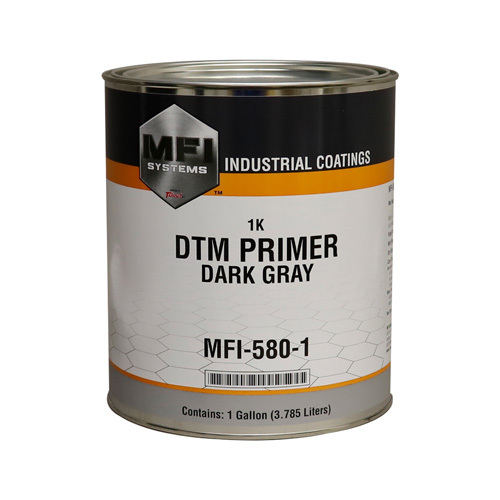 MFI-580 1K DTM Primer is a high build, industrial grade primer that can be applied to properly prepared bare steel, pretreated aluminum, fiberglass and composite plastics. It has excellent corrosion resistant properties when applied to bare steel. There is no need to apply a pre-treatment primer. MFI-580 1K DTM Primer can be topcoated wet-on-wet without sanding after 20 minutes. DTM Enamel Primers can be topcoated without sanding in as little as 30 minutes. To Sand: 90 – 120 min. Bake Time:15 min.